I’ve told you all before that I rarely give store bought gifts or money at a wedding. That was the reason I ventured into Personalized Pyrex and Kitchen Towels a year or two ago. So hopefully it is no surprise to anyone when I show up at a wedding bearing oddly shaped and often home-made gifts. This February I was invited to a wedding with the reception in a hunting lodge. 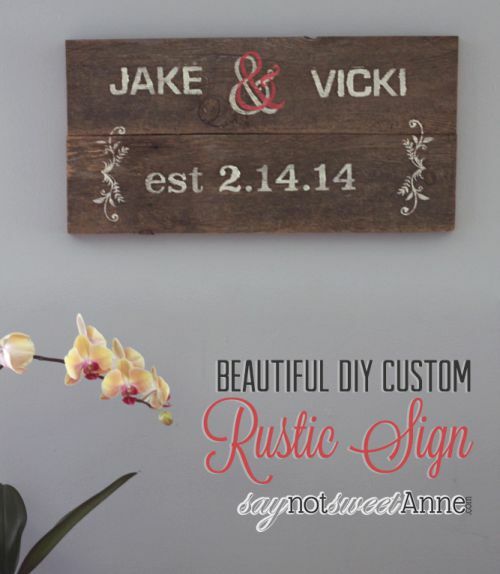 I knew immediately that I wanted to make a gift that reflected the outdoorsey and rustic nature of the couple. 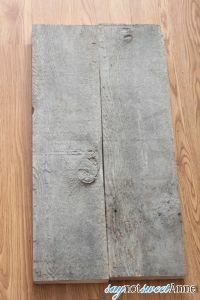 Weathered board a few feet long (Or you can weather some new wood using this Almost Instead Weathered Wood Stain). Hubby found ours above the garage when we moved in. Its cedar, but I don’t know how old. A dowel from a craft store, and a drill bit the same size. First step is to cut your board into two pieces of equal length. These will end up stacked on top of each other to make your sign base. Then, lay your boards how you want them to end up stacked. Mark a line across the gap where they join. 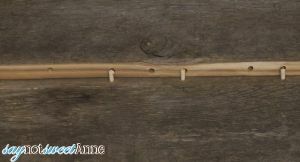 This will be the guide for your dowel holes. 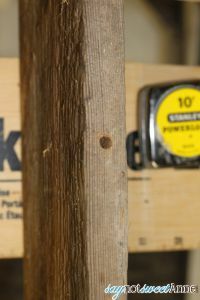 Following your lines, drill a 1/2 inch hole in each board along each mark. The picture explains it better than words. 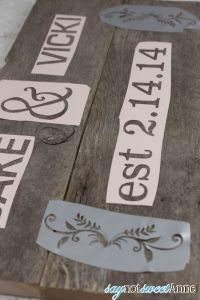 One sweet touch that is really easy is to layer some elements with a “shadow”. 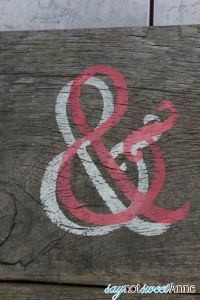 I just painted this ampersand white, waited until dry, offset the stencil and painted it again red! Once you’ve got your design painted, attache a picture hanging clip to the back. All done! Love this, Kayla! 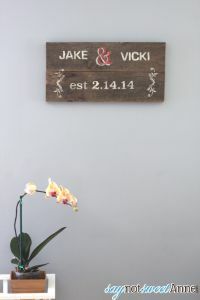 I’ve actually wanted one of these custom signs just like this! I’ve seen some on Etsy, but most of them are pretty pricey. Your tutorial makes it look so easy, though! I have been wanting to get a silhouette cameo for a while and this just gives me more reason to get one. 🙂 Definitely want to make this. Ahhh so cute! This doesn’t look too hard to make but is adorable! I need to make it for my next home.